Not Included: purchases from vendors, garage sale and Raffle Tickets. There will also be a Massage Therapist on hand. Includes snacks, lunch, supper and a chance to win a door prize. Please bring your own beverage, water will be furnished. There will be door prizes, raffle prizes, silent auctions and of course time to spend with friends while helping to fight MS. INCLUDED: chance at a door prize, unlimited snacks/drinks, 6 feet of crafting space and quality time with friends and family. NOT INCLUDED: hotel sleeping room, massages and purchases from the vendors on-site. All proceeds are donated to the National MS (Multiple Sclerosis) Society to help fund research efforts. 88c per $1 goes towards research. JOIN THE MOVEMENT. 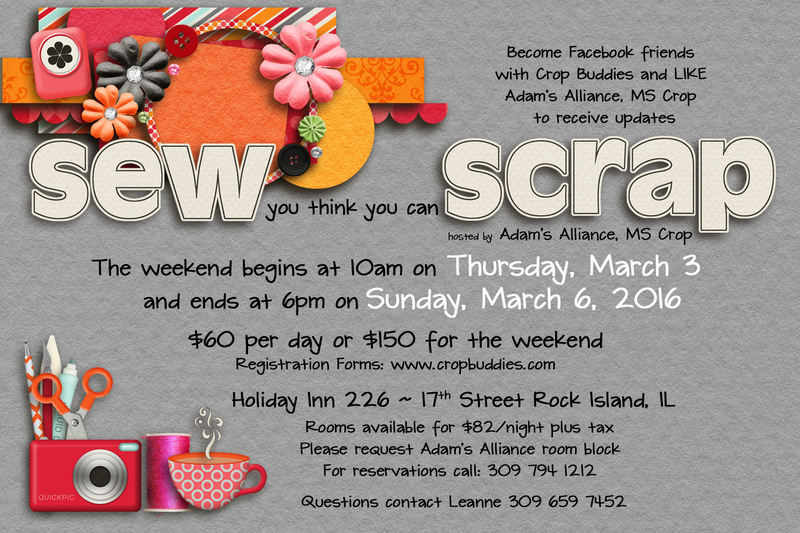 Since 2007, Adam’s Alliance, MS Crop has donated $28,685. We’re looking forward to breaking thru $30,000 with your help.